“Did you know that it’s International Scone Week? It’s not surprising if you didn’t, given that Joanna, Heidi and I made it up a couple of years ago. We found ourselves in a flurry of serendipitous scone baking, and had so much fun that we thought it would be lovely to repeat itannually. Combine the flour, sugar, salt and butter until the mixture resembles breadcrumbs. Add the egg and yoghurt to the flour mixture and knife through until just mixed through. Shape the mixture on a floured surface and cut using a cookie cutter – I got 12 scones. Place the scones on a baking tray and bake for approximately 10 minutes until a skewer inserted comes out clean. This entry was posted in Baking, Daily Blog, Recipes and tagged Baking, Food, Mandy Frielinghaus, Recipe, Scones, The Complete Cook Book, Yoghurt Scones by thecompletebook. Bookmark the permalink. I’m in love with this week celebration for scones! I haven’t made scones in ages, yours look lovely! Using yogurt to make the scones, interestig idea. You make it seems so easy. I didn´t know but I´m glad you told me! Love the yogurt in them, they look so light and fluffy 🙂 Mmmmm…..
Mands, these images are brilliant, makes me want to take a big bite out of the scones and I dont like cream (I’m pretending in my head that it’s icecream) so you must know they are excellent shots! The jam looks so delicious too. I love the look of these! I have started on trying cream scones for my traditional scones. I guess the ones we make in the US are too filled with additional bits and pieces to count – we load them up BEFORE we bake them and then scarf them down without need of butter and jam. Yogurt sounds like a nice alternative to cream- I’m going to try these next! I certainly did not know it was international scone week! I’m thrilled for any designated food week or day! These look so yummy, dripping with the jelly. Love that they are made with yogurt also! I like to bake different kinds of scones for the breakfast, but the cream/yoghurt one has got to be my favourite! Great fun !! 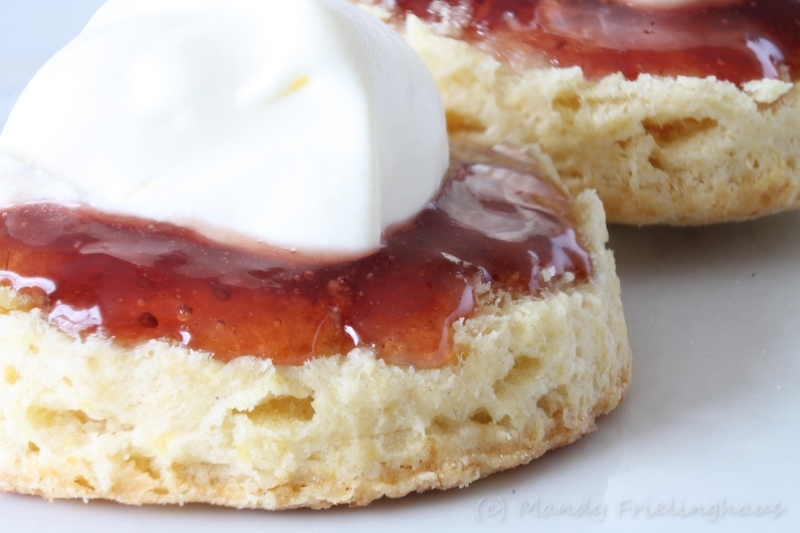 I’ve never tried making scones with yoghurt….. mmmmmm… what’s not to love ! I love scones when we travel but have never made them for myself. They appear rather easy but I have had some dry ones. I think it takes an expert to develop the right touch with mixing. 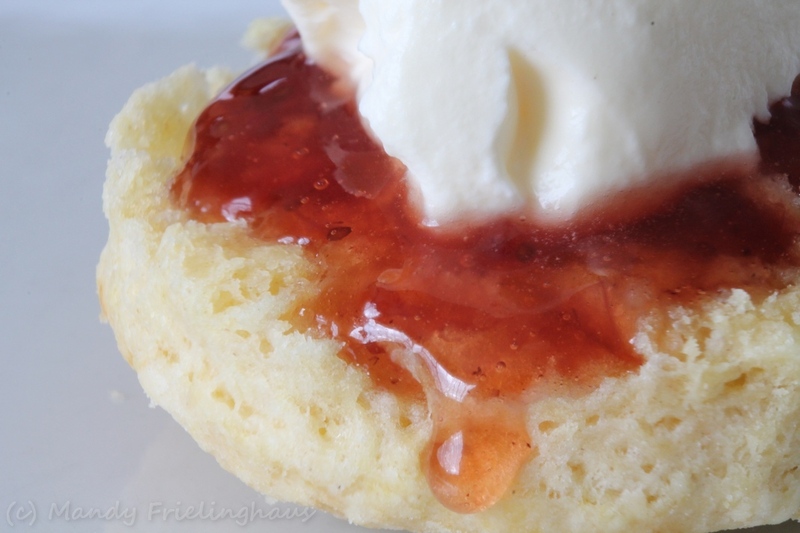 You had me going…I was saying to myself, how have I never heard of international scone week? 🙂 These look like something I would make with the yogurt in them…I always feel more healthy when something has yogurt in it. They look delicious with the jam, too! International Scone Week — or is it “Weeks” now? — is sweeping the globe. Australia, South Africa. Where will it be seen next? No matter. I need to learn how to make them. Yours, Mandy, is the 2nd great recipe that I’ve seen thus far during this celebration and I fear I’m missing out. I need to put scones on my list of things to make! Scones? Did someone say scones???!!!??? I had no idea this was International Scones Week, but you can bet I will more than make up for the delay in celebrating. They are one of my favorite things with my tea in the morning. This recipe sounds so good too! Thank you Mandy! They sure look good. I just had my scones for breakfast. How decadent is that? ““these look Fabulous, dear Mandy! Your scones are perfection Mandy! Love the pic of the honey being drizzled on. Beautiful! These scones look so inviting! Perfect with a cup of tea. I didn’t know it was international scone week. I’m going to have to get baking!! Love scones and these look so light and delicious. I’ve never used yogurt for scones but now I’ve got to try it. Have a great weekend! I bake scones almost every weekend, is part of our family tradition for Saturday breakfast. I never tried yogurt in scones. I’ll have to try next time! I love scones way more than muffins or even cupcakes and you are killing me with this delicious pictures. BUT I have scones waiting for me for tomorrow breakfast – unfortunately it’s from a bakery, but it’s from my favorite! 😀 Okay one day I’ll bake my own!! Apparently it is International Scone week, at least according to The Complete Cook Book. I will add a link to my recipe here. Might go and have a scone and ponder the political situation…. Never knew there was such a week…delicious!